I've been doing a reasonable amount of riding lately - between 150 and 250 km per week, and have joined the local bike racing club. I'm currently riding two bikes; my Audax bike, which I built a number of years ago from Columbus Zona tubing with Henry James lugs, and a really super-crappy Avanti 29er mountain bike that I ride when I'm out at work (the nearest paved road to where I work is about 200km away). Anyway, most of my kilometers are on the Audax bike, with nice relaxed geometry, 42cm chainstays, and downtube shifters. I've updated that a little, swapping all the '99-'03 Chorus parts out for NOS equivalent Record stuff. It looks great and rides pretty nicely. I also built some new lightweight wheels, as my Nisi rims were starting to pull through on the spoke holes. I went for Ambrosio Crono rims, with 28 DT rev spokes per wheel (DT comps on the rear drive side) and my '06 odd Record hubs. Surprisingly I found my used Record hubs are worth much more than I bought them for new - Campy no longer make them and they're much sought after, especially in the 28 spoke drilling. The new wheels are a delight, shod with Veloflex Criterium singles. The Audax bike, though very nice and comfy, and reasonably quick, isn't a race bike. It's maybe half a kilo heavier than it could be and a tad relaxed. Good for long rides (even long road races), and just the ticket for training rides, but a bit lazy for crits. I confess the DT levers are something of a handicap too - watching others change gears in the sprint makes me want ergos again. I figured it was about time I got to building again, so I dug out my set of Genius tubes and started. 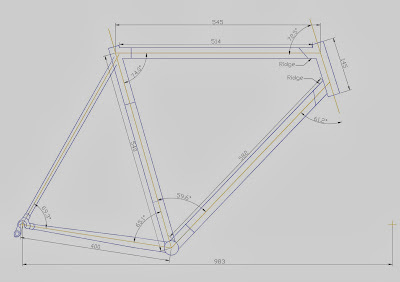 The plan for a road bike has been around for a little while, my only change is to make it perhaps a little more aggressive than I might once have. As mentioned, it's using Genius OS tubes, the lightest tubes I know of, and Henry James plain steel lugs. I've shortened the top tube by 5mm from that of my Audax bike, and shortened the seat tube by 10mm. The chainstays have come in a whopping 20mm. I've upped the seat tube angle to 74 degrees, but stuck with a 72.5 degree head tube angle. The result should move the seat forward a centimeter or so, and the bars down by a similar amount, making for a more aggressive position, just right for short races. Alas the place where I'm living isn't really amenable to brazing, so my plan is to take the bits out to the accommodation at my work (a big cattle station), and do the messy brazing out there in a shed in my time off. I've also started collecting bits for the build - NOS Record 10 speed groupset with carbon ultratorque cranks, Columbus minimal carbon fork, 3T carbon seatpost and carbon deep drop bars. Should go quite nicely, and hopefully weigh under 8kg.